Set overlooking the Cala mandia white sand beach, Insotel Cala Mandía Resort & Spa is surrounded by meadows, pine trees and landscaped lawns to take you away to a world of peace and tranquillity. The hotel offers five swimming pools, a splash park and a scuba diving school just to mention a few amenities. Showcasing resort style architecture with lots of open spaces and common areas, this hotel is ideal for families with children and couples. 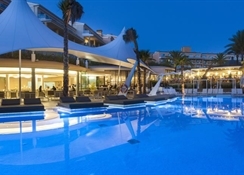 With a host of themed restaurants, including one fifties styled diner and bars, Insotel Cala Mandía Resort & Spa is the place to make your Majorca holiday truly memorable. The hotel is also amazingly close to various shops, restaurants and shopping areas. Located by the turquoise waters of the Cala Mandia Bay, Insotel Cala Mandía Resort & Spa is at a distance of 4km from the fisherman´s village of Porto Cristo. The nearest airport, the Palma de Mallorca Airport is 64km from the hotel. Enjoy state-of-the-art amenities in all the 514 rooms in Insotel Cala Mandía Resort & Spa like air conditioning, free Wi-Fi internet connection, safety deposit box minibar, telephone, two flat screen TVs, hairdryer and bathroom amenities. Guest can choose between Family suites, Family Suite Residentes Baleares, Adults Only residential suites, Superior Adults Only swim-up suites, Classic Garden apartments, Family Garden Suites, Classic apartments, 2-bedroom Classic apartments, and others. The hotel offers a range of bars and restaurants for guests to unwind, relax and rejoice in a wide range of gastronomical delights. There is a Grand Buffet restaurant which offers buffet services with indoor and outdoor seating, and organises cooking shows. The restaurant is open for breakfast, lunch and dinner. The South Pool Bar, Lounge & Restaurant is for adults only. The Fifties American diner is a restaurant decorated in the fifties style and serves authentic hamburgers, hot dogs, fries, chicken wings, salads, milkshakes, desserts and much more. There is also the Flower Power Restaurant & Pool Bar and the Surf Restaurant & Pool Bar at the hotel. The premises of the hotel are divided into Area A, B and C. the Area A houses two pools for adults and one for kids, spray pad fountain for children, Prestige Spa and Insi Sensation Spa. There is an adults-only section of Area A that offers a specially designed pool with exclusive water features, water loungers and a hydro-massage pool. Area C is family specific and offers Insi Family Splash, Insi Play Park, Insi Club and Insi Tiny Park & Pool, areas specifically designed for children. Sporting facilities are aplenty here, with the hotel offering mountain bikes, gym, basketball, table tennis and volleyball. The hotel also provides facilities for horse-riding, golf, water polo, aqua gym, aerobics, Zumba and much more.